Hiroshima was the first city subjected to nuclear warfare on 6th August 1945 at 08:15am when the atomic bomb Little Boy was dropped by the US aircraft Enola Gay and detonated about 600m over the city with the force of 110 kilotons of TNT in a 1 mile blast radius and a firestorm that spread over 4.4 miles caused by heat, light and radiation. The estimated population of Hiroshima was 250,000. Of that, 80,000 died instantly from the blast and another 70,000 injured. Burns, radiation and related diseases led to a death toll exceeding 90,000 by the end of 1945. Last year the toll was over 258,000 deaths. 69% of buildings were destroyed with 6.6% more severely damaged by the explosion. Sixty-four years later, the city continues to campaign for the abolition of nuclear weapons. The hibakusha ('explosion-affected people') were those survivors of the nuclear incidents at both Hiroshima and Nagasaki. They face discrimination due to ignorance about radiation sickness and it's related conditions, often being declined employment due to their status and some hibakusha prefer not to declare their status to receive benefits for fear of discovery of their status since there are erroneous beliefs about contamination through the blood. The average age of the hibakusha is about 73. Their descendents are also considered hibakusha and their legacy of radiation-related conditions continue so the number of dead now exceeds the original population of Hiroshima. The recollections of Miyoko Matsubara, a hibakusha who refused to go to the States for surgery is a chilling account of the explosion. Others can be found on the web but all are not easy to take in. Not all hibakusha were Japanese either. 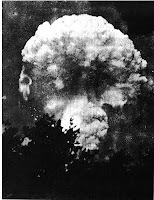 A surprising number of Korean and Chinese were also affected by the explosion - about one in seven of those killed as a result of the Hiroshima explosion were Korean. They faced difficulties in getting recognition for their suffering until recent lawsuits began to address this. Unlike people, the bomb didn't discriminate. The Hiroshima Maidens were twenty-five young women among the hibakusha whose bodies were affected by the blast. The dark patterns on their clothes were burned into their skins, their faces twisted by keloid scarring and hands crooked into claws. Ten years later they travelled to the United States for extensive reconstructive surgery at Mount Sinai Hospital, New York which helped to rebuild their bodies. During this time their public appearances raised awareness of the impact of nuclear weaponry; one of the most shocking was the NBC show 'This Is Your Life' where two hibakusha were hidden behind screens 'to prevent embarrassment' and compere Ralph Edwards brought out Lt. Robert Lewis, co-pilot of the Enola Gay to give a brief speech. He later committed suicide after being institutionalised due to guilt and depression.